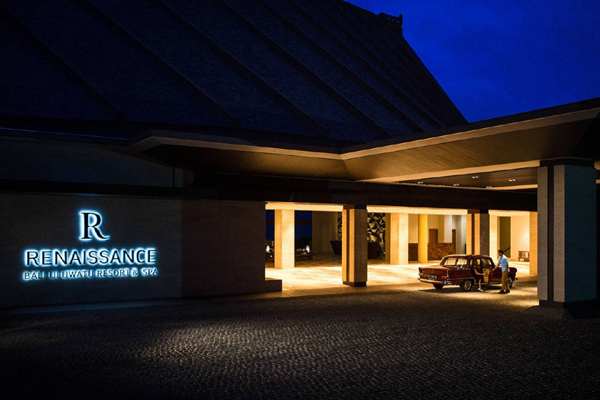 Renaissance Hotels, part of Marriott International, has announced its debut in Indonesia, with the opening of the brand’s first hotel in Bali. Owned by PT. Alam Bali International, the 207-key Renaissance Bali Uluwatu Resort & Spa is the southernmost Marriott hotel on the island and overlooks Bali’s Bukit peninsula, best known for the cliff-fringed coastlines. Balanced on the edge of Bali, “Ulu” meaning “Lands’ end” and Watu meaning “Rock,” the hotel is thoughtfully-designed to reinterpret the destination’s rocky cliff coastlines through contrasting materials, such as raw concrete and refined rattan. The exterior roof design can be seen for miles and is inspired by the leatherback turtle that has come to nest on the Bukit for centuries, allowing the sea breeze off the Indian Ocean to flow seamlessly through the lobby and all areas of the resort. With stunning views of the Indian Ocean or the lush lands of the Bukit, each guestroom and suite features a private balcony, luxurious bathrooms that include freestanding tubs and artfully designed interiors that layer Ikat patterns on tiles and textiles. The contemporary interiors complement traditional Balinese accents bringing together wooden floors and bamboo with sculptural water features. The culinary concepts at Renaissance Bali Uluwatu are as immersive as they are engaging. Clay Craft Restaurant is the hotel’s signature three-meal restaurant that incorporates an interactive pottery school concept to its space, while Double Ikat Restaurant offers delicious authentic Indonesian cuisine with a Cooking Studio that allows guests to learn the techniques and secrets of Indonesian cookery, as taught by the Chef in the restaurant‘s open-plan kitchen. The Pool Bar is the perfect place to grab a drink and enjoy one of the multiple pools overlooking the ocean. R Bar – located in the hotel’s lobby- offers some of Bali’s best views and an energetic evening gathering place with live music, canapés, cocktails, craft beers and fresh juices. Guests can find the hotel’s Navigator in this space as well, on hand to help guests discover hidden gems in the destination to savour, shop, sip and see the best local discoveries. Guests can enjoy the main infinity pool with views over the ocean and Balinese coastline, the saltwater pool and a separate pool for children. For guests looking to rejuvenate, the hotel’s spa offers 11 treatment rooms and a number of private relaxation areas. The Spa specialises in combining local treatments and ingredients while delivering state of the art skilled therapists. The hotel's fitness centre overlooks the island of Bali with floor to ceiling windows.